ach La Française® doll is one of a limited series and is hand-sewn in our workshop in France. Through this precious doll, La Française® celebrates the French traditional know-how of Maison Lemarié. Her beautiful gown is inspired by the spectacular creations of the atelier known all around the world for its expertise. The delicate camellias upon her tulle skirt are a reverence to Gabrielle Chanel’s iconic flower handmade by Lemarié since the 1960’s. The light and airy feathers adorning her waist are a tribute to the exceptional feather work made by the atelier at the request of the most prestigious fashion houses. The subtle embroideries and pearls upon her gown give this doll a very haute couture allure! «Béatrice» measures 45 cm (17,7 inches). She is wearing a delightful tutu and chic top sewn directly upon her delicate pur cotton body. The arms are attached with discreet buttons. A precious Swarovski crystal forms her little mouth. In her back is sewn a magnificent embroidered La Française® label. Our dolls are designed with the greatest delicacy, passion and care. Entirely handmade in France each doll is created in very limited editions. The fabrics and supplies are mainly sourced in France. Elegant and refined, our dolls are imagined as beautiful objects of decoration. To maintain their beauty and quality we recommend not to undress them. Wrapped in silk paper, each doll comes with an elegant La Française® label embroidered pouch that can be used for travelling or storage. To add a precious finishing touch to her silhouette, each La Française® doll comes with two exquisite purses matching with her gown. Created to make us dream of magical worlds it is suggested not to leave small children alone with La Française® dolls. All dolls are made to order and will be shipped within 1-2 weeks. ach La Française® doll is one of a limited series and is hand-sewn in our workshop in France. Inspired by the dazzling night life of The City of Lights at the beginning of the twentieth century, «Hortense» is our elegant Parisian! Wearing a refined velvet red shawl delicately closed by a precious Swarovski crystal she is extremely chic. In love with French plays she never misses a single performance and is the most looked upon Parisian spectator. With her shining feathered headband she catches the admiration of the whole audience. «Hortense» measures 45 cm (17,7 inches). She is wearing a delightful tutu and chic top sewn directly upon her delicate pur cotton body. The arms are attached with discreet buttons. A precious Swarovski crystal forms her little mouth. In her back is sewn a magnificent embroidered La Française® label. Our dolls are designed with the greatest delicacy, passion and care. 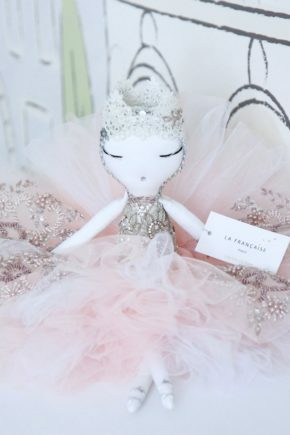 Entirely handmade in France each doll is created in very limited editions. The fabrics and supplies are mainly sourced in France. Elegant and refined, our dolls are imagined as beautiful objects of decoration. To maintain their beauty and quality we recommend not to undress them. Wrapped in silk paper, each doll comes with an elegant La Française® label embroidered pouch that can be used for travelling or storage. To add a precious finishing touch to her silhouette, each La Française® doll comes with two exquisite purses matching with her gown. Created to make us dream of magical worlds it is suggested not to leave small children alone with La Française® dolls. ach La Française® doll is one of a limited series and is hand-sewn in our workshop in France. Inspired by the elegance of the royal Swedish family, «Estelle» is named after their sweet daughter! Wearing a soft satin top and a golden headband with a light white feather she is highly majestic. «Estelle» measures 60 cm (23.6 inches). She is wearing a delightful tutu and chic top sewn directly upon her delicate pur cotton body. The arms are attached with discreet buttons. In her back is sewn a magnificent embroidered La Française® label. To add a precious finishing touch to her silhouette, each La Française® doll comes with two exquisite purses matching with her gown. Our dolls are designed with the greatest delicacy, passion and care. 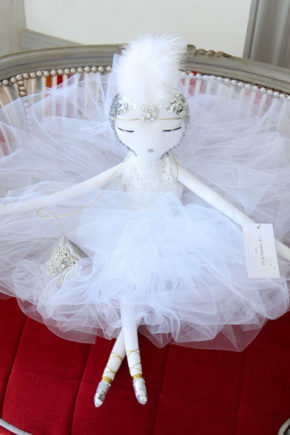 Entirely handmade in France each doll is created in very limited editions. The fabrics and supplies are mainly sourced in France. Elegant and refined, our dolls are imagined as beautiful objects of decoration. To maintain their beauty and quality we recommend not to undress them. Wrapped in silk paper, each doll comes with an elegant La Française® label embroidered pouch that can be used for travelling or storage. To extend the magic of La Française® and to pursue the royal dream even further, a beautiful child size crown is offered with purchase of every large size doll. Created to make us dream of magical worlds it is suggested not to leave small children alone with La Française® dolls. ach La Française® doll is one of a limited series and is hand-sewn in our workshop in France. Inspired by the Grimm brother’s fairy tale, «Bérénice» is our beautiful Snow White doll. Wakened from her deep slumber by her prince, she shines with love and happiness in her sparkling corset and glistening headband. Immaculate white, she is as pure as snow. «Bérénice» measures 60 cm (23.6 inches). She is wearing a delightful tutu and chic top sewn directly upon her delicate pur cotton body. The arms are attached with discreet buttons. In her back is sewn a magnificent embroidered La Française® label. To add a precious finishing touch to her silhouette, each La Française® doll comes with two exquisite purses matching with her gown. Our dolls are designed with the greatest delicacy, passion and care. Entirely handmade in France each doll is created in very limited editions. The fabrics and supplies are mainly sourced in France. Elegant and refined, our dolls are imagined as beautiful objects of decoration. To maintain their beauty and quality we recommend not to undress them. Wrapped in silk paper, each doll comes with an elegant La Française® label embroidered pouch that can be used for travelling or storage. To extend the magic of La Française® and to pursue the royal dream even further, a beautiful child size crown is offered with purchase of every large size doll. Created to make us dream of magical worlds it is suggested not to leave small children alone with La Française® dolls. ach La Française® doll is one of a limited series and is hand-sewn in our workshop in France. 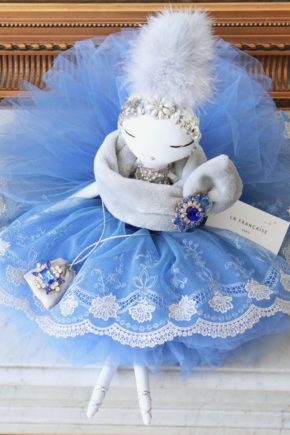 This precious doll is named «Jeanne» after the French Haute Couture icon Jeanne Lanvin. Dressed in Fra Angelico blue, one of the designer’s favorite colours, later named Lanvin blue, this doll is highly elegant. Her voluminous skirt with delicate lace details is a tribute to one of Lanvin’s signature pieces - la robe de style. With her luxurious feathered headband, glamorous jewels, fur and purse, «Jeanne» is perfectly in line with the skillful seamstress’ idea of feminity : romantic and chic. «Jeanne» measures 45 cm (17,7 inches). She is wearing a delightful tutu and chic top sewn directly upon her delicate pur cotton body. The arms are attached with discreet buttons. A precious Swarovski crystal forms her little mouth. In her back is sewn a magnificent embroidered La Française® label. Our dolls are designed with the greatest delicacy, passion and care. Entirely handmade in France each doll is created in very limited editions. The fabrics and supplies are mainly sourced in France. Elegant and refined, our dolls are imagined as beautiful objects of decoration. To maintain their beauty and quality we recommend not to undress them. Wrapped in silk paper, each doll comes with an elegant La Française® label embroidered pouch that can be used for travelling or storage. To add a precious finishing touch to her silhouette, each La Française® doll comes with two exquisite purses matching with her gown. 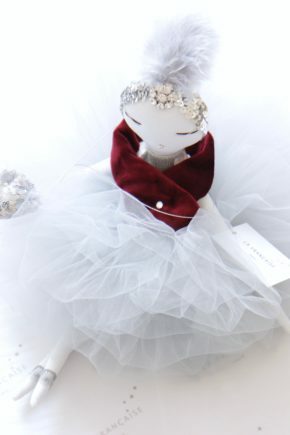 To create a royal duo and match the precious doll, a child size lace crown is offered with «Jeanne». Created to make us dream of magical worlds it is suggested not to leave small children alone with La Française® dolls. ach La Française® doll is one of a limited series and is hand-sewn in our workshop in France. This refined creation was designed as a special tribute to the famous Sissi and therefore bears the title of «Empress Elisabeth». The purity of her snow white face set against the soft coral pink shade of her gown recalls the youthful beauty of Sissi who was married to Franz Joseph I. Officially portrayed by Franz Xaver Winterhalter wearing diamond and pearl stars in her hair, such ornaments soon became part of her signature. As a reminder of this precious symbolism, this doll has similar shaped embroideries upon her tulle skirt. To remind us of her high status, «Sissi» wears a graceful lace crown. «Empress Elisabeth» measures 45 cm (17,7 inches). She is wearing a delightful tutu and a precious embroidered top sewn directly upon her delicate pur cotton body. The arms are attached with discreet buttons. A gorgeous Swarovski crystal forms her little mouth. In her back is sewn a magnificent embroidered La Française® label. To create a royal duo and match the precious doll, a child size lace crown is offered with «Empress Elisabeth». Our dolls are designed with the greatest delicacy, passion and care. Entirely handmade in France each doll is created in very limited editions. The fabrics and supplies are mainly sourced in France. 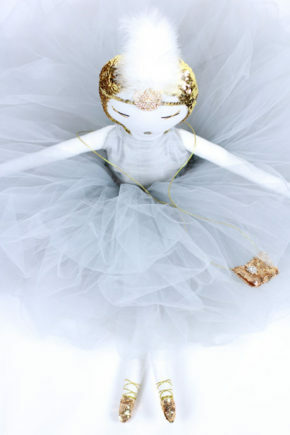 Elegant and refined, our dolls are imagined as beautiful objects of decoration. To maintain their beauty and quality we recommend not to undress them. Wrapped in silk paper, each doll comes with an elegant La Française® label embroidered pouch that can be used for travelling or storage. To add a precious finishing touch to her silhouette, each La Française® doll comes with two exquisite purses matching with her gown. 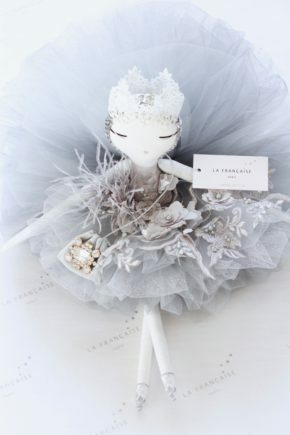 Created to make us dream of magical worlds it is suggested not to leave small children alone with La Francaise® dolls.